One of twin has started loving this aloo parantha (Potato filled Rotis) all of sudden. She is taking these aloo paranthas even for her lunch box once a week. 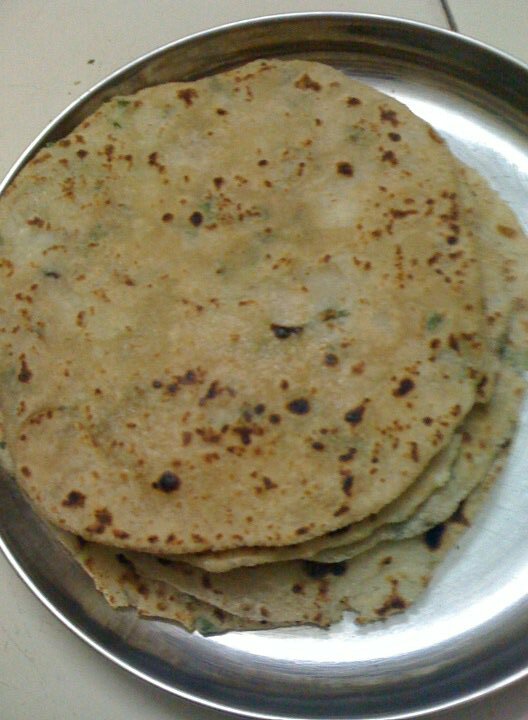 Thanks to kids in her school:) I made these paranthas for our dinner last week and refrigerated some stuffing for the next day's lunch box. I blindly followed Manjula's Kitchen Video for making these. It came out very well. Here is the recipe. Prepare the dough first and keep it aside. Add required amount of salt and water and knead the dough. Spread oil on top and cover it with a lid or a cloth. Keep it aside. Boil the potatoes, remove the skin and take it in a vessel. To that add finely chopped green chillies, coriander leaves, salt and ginger and mash it with a fork. Scramble it really nice so that all the ingredients mix together with potato. Make small balls out of it. Also make same number of balls with dough. Potato balls should be little bit bigger than the dough balls. Now make a small poori sized roti, keep the potato balls and cover it just like how we do for making kozhakattai. Keep it till you roll all the potato balls (the recipe asks for keeping it some time). Now start rolling the stuffed rolls in to paranthas of 6 to 7 inches sized. Cook it in a hot tawa (iron skilled preferably). Coat it with some oil/ghee of your choice (I skipped it). Enjoy it with some pickle & Yogurt. My all time fav..droolworthy aloo paratha..
aloo paranthas indeed. comfort food and anytime welcome one too. good Vidhya!